This True Low air loss mattress system is commonly used in many hospitals across the country to keep patients comfortable. 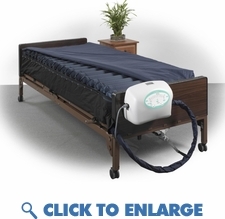 Its an extraordinary therapeutic mattress system that is used for a wide variety of patients for optimal comfort, pressure relief, and the healing of up to stage 4 bed sores. This true low air hospital mattress system supports up to 1000 lbs. and covers the entire spectrum of pressure relief for patient comfort. The 9000 series pump offers a 10 zone comfort setting that allows pressure to be customized by a patients weight. True low air loss therapy is designed to wick away moisture, preventing heat and moisture build up and protecting the skin from sheering and breakdown. The 9000 series pump produces 1180 liters of air flow per minute offering a cool and dry sleeping surface. This true low air loss system is loaded with state of the art options and features making it the best available on the market today. In additional to the low air loss therapy the 9000 series has added a unique pulsation mode that reduces the air flow every 30 seconds to 50% of the comfort setting. This feature adds enhanced comfort and healing benefits and will intermittently reduce pressure and increase blood flow. The pumps internal pressure control sensor continuously monitors surface pressure for optimal pressure redistribution. Designed for hospitals, long term care and now available in home health. The newly designed auto firm feature allows for a 1 minute fill rate, 20x faster than most alternating pressure mattress systems. The built in static float option can temporally suspend the pulsate mode allowing the patient to easily transfer in and out of bed, easier turning and a firmer support surface when administering patient care. We recently added a 2" convoluted foam base that offers additional protection in the event of a power outage. Visible and audible alarms are built in to protect the patient and includes a CPR valve for rapid deflation. Look no further this is best hospital grade true low air loss mattress available on the market today. It is the most comfortable adjustable mattress in its class and its cloud like sleep surface will benefit even the most demanding patients. This mattress system is commonly used by cancer / Oncology patients, Spinal Cord Injury patients, Multiple Sclerosis patients, Burns and Skin Flaps/Graft patients , Multiple Sclerosis Patients, Long term care, Arthritis and pain management patients. This True Low air loss mattress system is commonly used in many hospitals across the country to keep patients comfortable. Its an extraordinary therapeutic mattress system that is used for a wide variety of patients for optimal comfort, pressure relief, and the healing of up to stage 4 bed sores. This true low air hospital mattress system supports up to 1000 lbs. and covers the entire spectrum of pressure relief for patient comfort. The 9000 series pump offers a 10 zone comfort setting that allows pressure to be customized by a patients weight. True low air loss therapy is designed to wick away moisture, preventing heat and moisture build up and protecting the skin from sheering and breakdown. The 9000 series pump produces 1180 liters of air flow per minute offering a cool and dry sleeping surface. This true low air loss system is loaded with state of the art options and features making it the best available on the market today. In additional to the low air loss therapy the 9000 series has added a unique pulsation mode that reduces the air flow every 30 seconds to 50% of the comfort setting. This feature adds enhanced comfort and healing benefits and will intermittently reduce pressure and increase blood flow. The pumps internal pressure control sensor continuously monitors surface pressure for optimal pressure redistribution. Designed for hospitals, long term care and now available in home health. The newly designed auto firm feature allows for a 1 minute fill rate, 20x faster than most alternating pressure mattress systems. The built in static float option can temporally suspend the pulsate mode allowing the patient to easily transfer in and out of bed, easier turning and a firmer support surface when administering patient care. We recently added a 2" convoluted foam base that offers additional protection in the event of a power outage. Visible and audible alarms are built in to protect the patient and includes a CPR valve for rapid deflation. Look no further this is best hospital grade true low air loss mattress available on the market today. It is the most comfortable adjustable mattress in its class and its cloud like sleep surface will benefit even the most demanding patients. This mattress system is commonly used by cancer / Oncology patients, Spinal Cord Injury patients, Multiple Sclerosis patients, Burns and Skin Flaps/Graft patients , Multiple Sclerosis Patients, Long term care, Arthritis and pain management patients. Offers an extraordinary therapeutic mattress system for the prevention and treatment of stage 4 pressure ulcers. Produces 1180 liters of air flow per minute offering a cool and dry sleeping surface. The 10 Adjustable Comfort Settings allows pressure to be customized by patient's weight. The exclusive Pulsate mode reduces the air flow every 30 seconds to 50% of the comfort setting. This feature will intermittently reduce pressure and increase blood flow. The internal pressure control sensor continuously monitors surface pressure for optimal pressure redistribution. For use in the Homecare, Long Term Care, and Acute Care Markets. 2" convoluted foam base in case of power outage. Static function can suspend the pulsate mode. Visible and audible alarms with Alarm Mute feature. Mattress Dimensions	80" x 36" x 10"